Gosh haven't been on here for a while! Phoebe is coming on leaps and bounds. She can roll from tummy to back (but noth the other way) We ave one tooth already and the second is about to make an appearance. She is very vocal and can say mumma, da da and bear! I love to here her babbling. Im loving being a mummy and im actually looking forward to being a working mummy. I hope that start back at work goes well and it doesn't take long to adjust to it. Matilda is almost 8 1/2 months now, and quite a big girl. She would love to be crawling or walking but hasn't got the hang of either! She can roll a lot, both ways, and is forever getting tangled in things/under tables etc. She pulls herself to standing but doesn't know what to do after that so just bends forward and falls down! She is making lots of sounds, but not dada, and is a very giggly hapy baby.... apart from when she is hungry - you wouldn't want to delay her at dinnertime as she is a little madam! I see a future battle of the wills with M as she is bossy and demanding.... and cheeky! She was pullign the tablecloth off the table the other day, I said no and removed her hand from it... she pulled it again, I said no - she looked at me and did a really cheeky little giggle. We are trying for baby no.2 and I'm half optimistic that this might be the month (based only on the fact that the night before last I dreamt I was pg, and then yesterday and today have had a lot of nausea)... so we'll wait and see on that one! 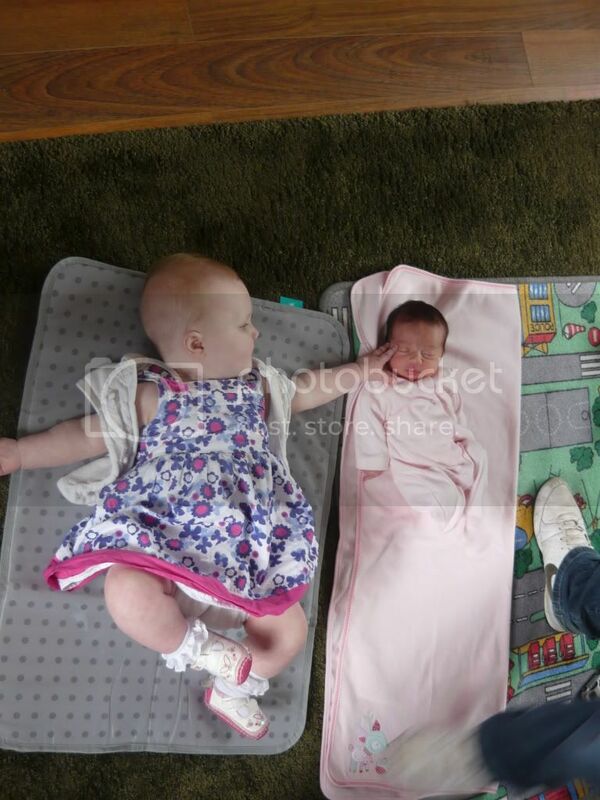 Here is a recent pic of Matilda with her 2 week old cousin (who was born 5 weeks early)! Aw what cute little babies! Phoebe is 9 months tomorrow - how fast has the time gone?! I am also now a working mummy and I have to say I am really enjoying it. I work four days and have found that I really appreciate my time with Phoebe so much more now that I have to be away from her. I am lucky because as a teacher I get the holidays off, technically I have been back to work for 5 weeks but I have actually only worked for three of them because of Easter. It is hard on the days I work because it feels a little bit like I am on a treadmill. Our morning routine is like a military operation to get everyone ready and out of the door. Then, Hubby and I take it in turns to finish by 4pm and pick Phoebe up so that we have a good chunk of time with her in the evenings before bed. Then once she goes to bed we both get our laptops out and start doing all of our lesson planning and school stuff before collapsing into bed exhausted. Its hard but I am enjoying the balance of work 'me' and mummy 'me'. Phoebe is doing really well though. She is a very happy and sociable baby, although she knows what she wants and can be a madam if she is told no! She has even started to become a little more cuddly. She used to only seem to want me to hold her in order to facilitate her doing something, now she comes for cuddles and lays her head on my shoulder which I just love! She has been crawling and walking around the furniture for a couple of months now, her latest is climbing up. I cant leave her for a second because she starts to scale the coffee table or try and pull herself up on to the sofa and ends up falling over! I remember thinking, when she had colic, that it must get easier as she got older, but now she can do things for herself it is such hard work, but in a lovely way! She has just cut her 8th tooth so has a mouth full of teeth but still not much hair yet! If this works you should see a picture of my little monkey climbing head first into her bouncer, sorry for the poor quality but I took it on my phone! Glitterbug I'm glad you have adjusted to work/ family life. You are lucky being able to finish so early. Both me and hubby are coppers so have to work shifts. My late shift is till 8 pm. Thankfully because I'm a detective on child protection I don't work nights. It must be something to do with Phoebe's because my Phoebe can be a little madam as well. If she doesn't like something she will push it away lol she is so funny. Hi all, lovely to read about the growing babies Alfie feel free to join us, my baby was born on 15 August but I stated here as I was originally DIJ and the ladies in here are lovely! 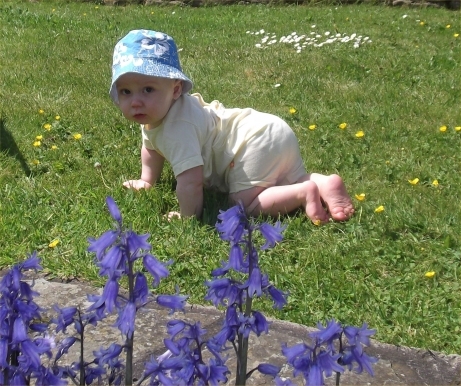 Gorgeous pictures of your little ones! Sounds like everyone getting on well. Other than chicken pox, Finley is growing up so beautifully. He is a gorgeous, happy little boy. He loves toy cars at the moment, rolling them round on the floor. 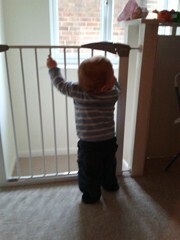 He is cruising round everywhere (and has been for a while now) but is not brave enough to let go yet! hello ladies, thought i would pop in with a little update, your babies are all so cute! !